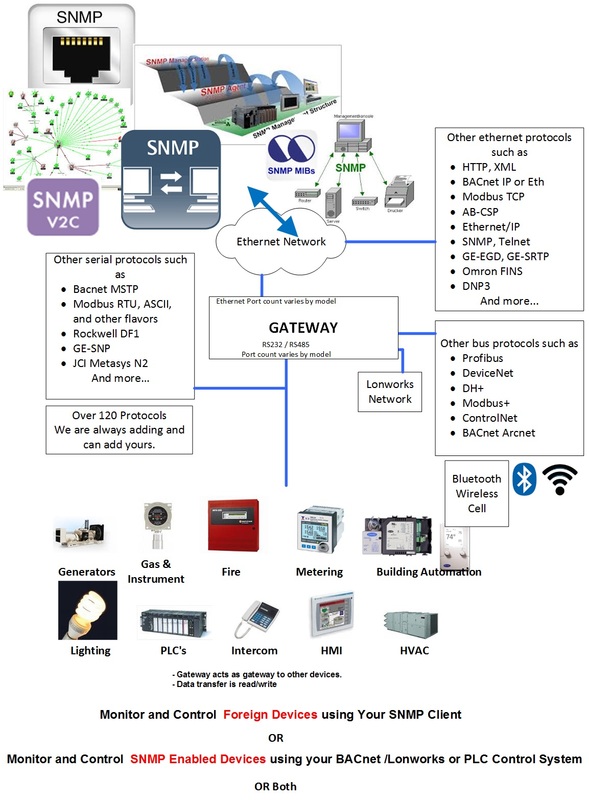 A FieldServer protocol gateway that provides data exchange between SNMP Standard MIB and BACnet MSTP. The SNMP-STD driver allows the FieldServer to transfer data to and from devices over Ethernet using the SNMP Version V1 or V2c protocol. The BACnet Master-Slave/Token-Passing (MSTP) driver implements a data link protocol that uses the services of the RS-485 physical layer. The BACnet Master-Slave/Token-Passing (MS/TP) driver implements a data link protocol that uses the services of the RS-485 physical layer. See the FieldServer BACnet PIC statement for the level of conformance that this driver implements. All information in a BACnet system is represented in terms of objects. The Object_Identifier is a 32-bit code that identifies the type of Object (also identified by the Object_Type Property) and its "Instance" number, which together uniquely identify the Object within its BACnet device. Theoretically, a BACnet device could have over four million Objects of a particular type. The Object_Name is a text string, which has a unique capability. BACnet devices may broadcast queries for devices that contain Objects with a specific Object_Name. This can greatly simplify project setup. Standard object types are used to hold real time data and other information. Each Object Type is referenced by a number, for example 0 represents an Analog Input. Each Object consists of a number of prescribed properties, the main property being the Present_Value. Objects are monitored and controlled through their properties. The Analog Input Object is representative of the Objects involved directly with control elements and many of its Properties reflect this. The SNMP-STD driver allows the FieldServer to transfer data to and from devices over Ethernet using the SNMP Version V1 or V2c protocol. The FieldServer can emulate a Server (SNMP Agent) or Client (NMS Network Management Station). The FieldServer provides a generic MIB (Management Information Base) file that sets out the OID (Object Identifiers) structure. The FieldServer Enterprise ID is 6347. A selection of standard MIB-2 OID’s are supported to allow interaction with popular Network Management packages. When configured as an SNMP Agent (Server) the SNMP-STD driver allows SNMP Get, GetNext (walk) and Set commands to access Data Arrays using the Integer type. The SNMP v1 protocol does not make provision for Floats. The SNMP-STD driver can send SNMP traps. The structure for SNMP Traps is provided in the FieldServer’s generic MIB file. The FieldServer also supports custom MIBs and the automatic generation of the MIB file. It supports setting a custom enterprise ID, object names and custom traps or informs. In custom configurations the FieldServer supports various data types as specified in Section 6.1 of the Manual. When configured as a Client, the FieldServer can read objects from the Server using Get, GetNext (walk) or GetBulk commands. The GetBulk command is very useful to transfer large amounts of data. The FieldServer can update objects in Agent using the Set command. The FieldServer can accept any trap or inform as long as all the objects in the message are encoded with a full OID. The Client side of the driver is considered as a custom configuration. A BACnet Router is used to connect MSTP trunks to BACNetIP systems. The router itself is a device on the IP and on the MSTP side. The router can also act as BBMD device allowing messages to cross from one subnet to another. BACnet messages cannot cross from one subnet to another except under special circumstances. Most BACnet sequenc es of messages begin with a broadcast called 'who is'. All devices respond with 'I am'. That is how they are discovered. It is also how many system confirm the device is still there. Broadcasts can't cross routers (they are blocked) and therefore devices on the other side of a router cannot e discovered. BBMD is the name of the BACNet technology that resolves these issues. The BACNet ROuter sold by CAS provides BBMD services as do all FieldServer BACNet products when configured as clients. What can go wrong with 485 and BACnet MSTP ?